Big Agnes Yampa 40: trail worthy and worth its weight! Lightweight, warmth, and comfort are characteristics the Big Agnes Yampa 40° down-filled sleeping bag delivers. You’ve been there…a breathtaking day of hiking and pushing your body to the next level of fitness. Your backpack is loaded with only the gear you need, but it all adds up. By the end of the day, you’ll likely be looking forward to some sleep. Getting good sleep over an extended period of time improves athletic performance and your general well being; especially on those rocky trails where alertness, balance and orientation are necessary. This writer really enjoyed her experience with the Big Agnes Yampa 40° Classic bag. At one pound and 14 ounces, you will love trekking out with this bag! We had no problem stuffing the Yampa into its small stuff sack measuring 7.5” x 15 inches. This packed size takes up minimal room and is great for backpacks with specifically segregated sleeping bag compartments at the bottom. Compressed, the Yampa 40° gets a whole lot smaller too. The easy-grip handle on the bottom of the nylon stuff sack makes it very convenient to pull the Yampa out at the end of the day. And when you’ve stuffed the Yampa into the sack for the next day’s trudge up the trail, the adjustable cord and enclosure of the stuff sack keeps the it secure. It’s a tight little package that works equally well for backpacking as it does for car camping or sleeping out on the deck at the lake lodge. Big Agnes Yampa 40 sleeping bag (bottom) and Air Core pad (top) in respective stuff sacks. small and really compliments the Yampa. Taken together, they offer good comfort, compactness, and give you a sleeping system that is durable and warm without being cumbersome to transport. Big Agnes also provides a cotton storage sack for those times you are off the mountain. While the best storage is to lay your bag flat or hang in a dry place, Big Agnes includes the cotton bag to offer an alternative for protection. Be sure to take your bag out of the cotton storage sack now and again, as the Yampa will benefit as well as we do with some fresh air. Let’s get Down to the comfort! The Yampa is insulated with 9.5-ounces of 650 fill goose down feathers. The baffle design and ribbed stitching helps distribute the feathers evenly throughout the bag and allows the down to loft around you. The cut of the Yampa allows enough wiggle room to get cozy and relax. Big Agnes is well known for designing sleeping bags specifically for the shape of a woman’s body. You won’t feel like you are trying to sleep in a hollow log, or feel constricted in any way. Just these qualities alone might make this a contender for the closest thing you can probably get to your own bed at home. The soft, breathable lining comes with a stain resistant finish as well as to insure integrity. 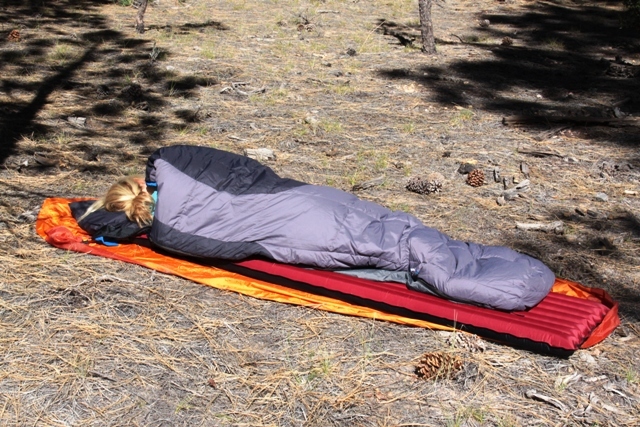 You don’t have to worry about moisture with this sleeping bag. It will be dry when you wake up as you enjoy the morning dew clinging to the central California coast oaks or look out to the ocean from your high point somewhere on the Olympic Peninsula of Washington State. Big Agnes uses a water resistant (WR) surface treatment to repel moisture. Not having to worry about a damp sleeping bag in the morning makes a big difference when you’re in a hurry to pack up and strike out along the next day’s challenge of hiking, and trying to cover some miles. It’s also cool to know you just got the rest you need to make it safely and quickly to that next amazing camp site. Foot box of Yampa 40 is generous. Two-way zipper allows good ventilation. Big Agnes comes with a pad sleeve so you won’t roll off, waking up uncomfortable and somewhat bewildered, in the middle of the night. These Classic Series bags are semi-rectangular and accommodate most overnight situations. A logo pull tie on the zipper let’s you remember who is keeping you comfortable. Extra stitching provides support and offers the durable wide zipper for increased durability and operating smoothness. At the shoulder area of our test Yampa, we had 70 inches of girth area to flop around on. The hip girth area is 66 inches as it tapers down to a foot-box girth of 54 inches. It all adds up to having plenty of room to get comfortable without sacrificing insulation performance. Some folks like to conduct their gear research in terms of how well the product might fit a couple who are looking for compatible outdoor products they can enjoy together. You’ll be happy to know that two Yampa bags can be mated to create a double wide deal. Oh the joy that brings to some people! Yampa’s pillow pocket works with a backpack cushion, down jacket, moss! season bag you can open up when it get warm. The two-way zipper allows you to open the bag a bit from the bottom for ventilation, perhaps letting your feet catch a cool breeze on warm evenings. The cinched enclosure at the top gives flexibility in controlling the airflow on cold nights as well. When the temperature drops, a Velcro tab fastens over the zipper and works to keep the it in place. With Yampa’s 40° comfort rating you can increase its warmth capability using a bag-liner, base-layer insulation, or over bag. Interior fabric loops are included inside the bag if you use silk or cotton liners. Loops at the outside base of bag can be used with stakes to keep Yampa in place in unsteady terrain. How can you not love the built in pillow holder that comes attached? On the Yampa, it’s a sleeved lining that allows a small pillow to be perfectly set in place. Or you can ball up your down jacket or sweater and create pillow with a little imagination. The Big Agnes Yampa is offered in a color combination of black-gray and blue-black that easily matches other gear you may have. You can look for these design characteristics in Big Agne’s other classic bags in various comfort ranges from 50° models for warmer weather, all the way down to 15° and even 0° bags for those winter trips to the cold country. You will get the same classic style with most of these same modern features. Big Agnes Yampa 40 interior is comfortable, warm, and durable. Big Agnes’ 40° Yampa comes in two different sizes. A long size for $169.95 and a regular size for $159.95. Check out the specification box below to determine which Yampa is right for you. Both bags are left and right-hand zipped. When you are in the bag lying on your back, the right zip will be on your right side, left zip on your left side. Overall, the Big Agnes Yampa Classic sleeping bag turned out to be really well designed, using excellent insulation, and constructed to last many seasons of use doing whatever it is you find yourself needing a sleeping bag. To create a such a bag with built-in features like the sleeping mattress sleeve to keep it in place, the roomy cut for comfort, and 650 fill goose down for insulation and cushiness, Yampa’s got it, in the bag.